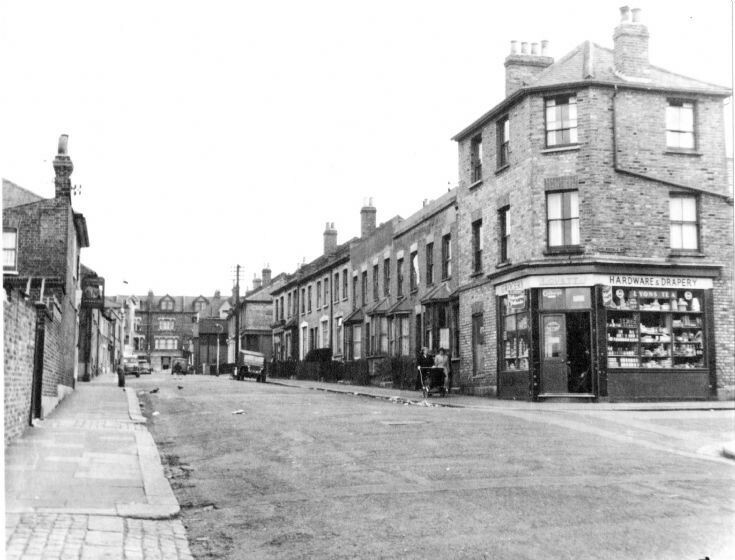 The corner shop on right (corner of Holmesdale Rd) was my home from birth in 1943 to 1948. The shop name was Phillpots and we lived upstairs. My gran lived at 5 Holmesdale Rd. When we moved to 20 Upper Park Rd in 1948, my gran, Annie Newby, soon came to live with us until her death in 1964. Within weeks we were re-located to 16 Ivy Road, Southgate, N14. In 1966 we moved to Whetstone. My nan lived in Holmesdale Road, not sure which number, and also my great nan lived there, my great gran was Mrs. Ellen Bean and my nan was Mrs. Marjorie Joyes, my mum was Betty Joyes, my mum also lived in the street as a child along with her 6 siblings, my grandfather was William Joyes. My nan also moved to Whetstone, she lived at 51, Russell Road until her death in 1978. I was born in the Avenue in 1938. We moved to miles away in 1939. My gran lived in the Avenue until it was pulled down. She was known as Mrs Marshall. Mrs Conway, my aunt, also lived there with her family. My dad Phillip Wick lived on The Avenue back in 1945 for a few years before the family moved to Muswell Hill. I know he attended St Pauls for a few years. As in the comment above, I lived at number 9 until it was demolished, my Father was Ernie Brett. As Walter mentions above, it was a very rough area, tramps lived in the half demolished houses which were our playground when I was young. I remember the Brown Jug off licence, the owner used to throw eggs at us through the doorway to 'see us off' as we were always hanging around! I went to St Paul's School, Miss Pightling was my headmistress. My dad was born at 58 The Avenue in October 1913. His name was George Herbage. His father's name was Henry and his mother was called Ellen. It seems Henry and Ellen split up quite early on and my dad ended up in Walthamstow. That is where our family were rooted. It’s lovely to see this picture. My dad died in 1967 when I was 8 and I never got to ask him about his family stuff. My Mums family lived down the Av. I remember it well always down there when I was a kid, my Mum was Barbara Millwood Grandad was Fred Millwood Nan Elizabeth . My dad's family lived down The Avenue. Satchell family - does anybody remember them? I was born in Lee Street.